Little Haiti is a neighborhood in the city of Miami located between Wynwood and the Design District. It’s bordered by Hwy I-95 and the East Coast Railway railroad tracks and goes between 54th and 87th streets. Little Haiti is the home of Haitian culture in the city. The neighborhood has bookshops, art galleries, music shops, and The Little Haiti Cultural Center where you can enjoy theater and dance shows. 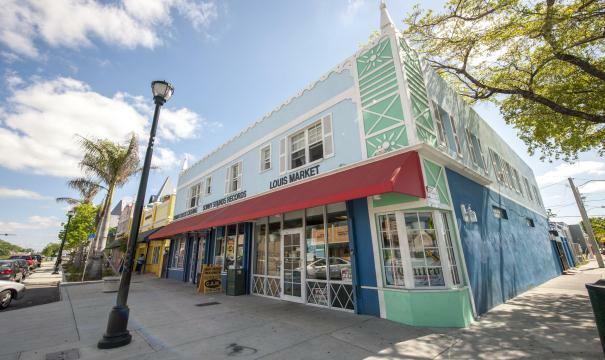 The architecture in Little Haiti is from the mid nineteenth century through early twentieth century, with houses built when the area was still an agricultural zone specializing in lemons. Those in rental cars can tour this ethnic neighborhood with african-caribbean roots and enjoy great Haitian music, especially at the corner of NE2nd Ave and NE 55th St. Here you’ll find Sweat Records and Churchill’s Pub, where all Haitian musical styles come together from punk to jazz. The cultural life of the neighborhood is facilitated and promoted by the Little Haiti Cultural Center, inaugurated in 2009 where you can take dance classes, see recognized artist at work, enjoy sculptures and crafts, and dance to the rhythm of the music of the country of the Antilles. Little Haiti is also art and design. There are independent shops and art collectives. The Patrimonial Museum of Haiti is located at 4141 NE 2nd Ave (to note in the GPS in your rental car) where you can see a beautiful collection of Haitian art, historic artifacts, and get to know some of their cinematography. The aroma of typical Haitian foods invites travelers to discover the neighborhood, a universe of tropical and caribbean flavors. Seafood, rice, and beans of all colors and varieties. Spicy and hot foods. Traditional desserts like fried bananas, sweet potato bread, or banana fritters. Lunch at the popular restaurant Chez Le Bebe, or in Soyka, or in the Buena Vista Bistro is a good way to get to know Haitian cuisine. In the past several years Haiti and other Miami neighborhoods such as Little Havana have become chosen destinations for those who want to get to know another side of Miami by delving into foreign traditions and nourishing themselves on their art and culture. To fully enjoy this and other Miami destinations it’s recommendable to reserve a rental car by internet through RentingCarz to get the best price with the most reputable companies on the market.